BUFFALO, N.Y. -- The coaches got their first looks at their teams in action when Team McClanahan and Team Housley hit the ice for practice Saturday morning here at First Niagara Center. A precursor to tonight's CCM/USA Hockey All-American Prospects Game, the workouts weren't long because some players arrived late Friday night or early Saturday morning. Waterloo Black Hawks defenseman Ian McCoshen didn't arrive until 2 a.m. Saturday after playing in Green Bay on Friday, and Portland Winterhawks defenseman Seth Jones landed in Buffalo at 10:15 a.m. Saturday after flying all night from the West Coast, with a layover in Atlanta. "We tried to keep it short because I know they're excited to play tonight," Team Housley coach Phil Housley said. "We had two good practices, they moved the puck around. A lot of these guys got in [Friday and Saturday morning] and they had a lot of media things to do this morning. Once we got out there they seemed to be focused very well and they're getting ready." Team McClanahan coach Rob McClanahan said he was impressed by what he saw from his team. "They're big and fast and strong and it'll be fun to see them play tonight," he said. "It's just fun to see these kids and how talented they really are at such a young age." 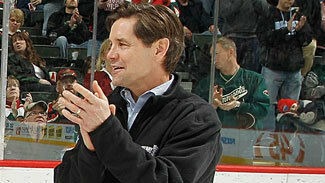 McClanahan, who works for a financial-services company in Minnesota, coaches at the youth level. The players he'll have Saturday are a bit older than what he's used to, so he's not sure what he'll say as a pre-game pep talk. "I'll probably quote Herbie [Brooks]," McClanahan said. "'You were meant to be here, you were born to be a player.'" McClanahan, who was one of the star players on the Brooks-coached 1980 U.S. men's Olympic hockey team, noted that in reality neither coach will play a major role in the game. "There's not much I'm going to be doing," he said. "I can give them some insight if they want. These kids have been through the paces. It's just a matter of keeping it light and having them get focused. And I think they'll be fine." Among the players McClanahan said he's most looking forward to seeing is Jones, the 6-foot, 3.5-inch, 208-pound blueliner projected by many scouts as a top-two pick for the 2013 NHL Draft. "I just met Seth," McClanahan said. "I haven't seen him play. I've talked to people about him, I've heard about him. He's a big boy. And he's on my team, so that's a good thing." "He's extremely talented," Housley said. "It just seems like he's made for today's game. He's big, fast, strong, can move the puck and make that first pass out of the zone, can play in all situations. I'm mad at Rob for taking him." Housley will have some other top-notch players on his team, but he said he'll be watching skaters from both sides for his other coaching job -- helping pick the U.S. team for the 2013 IIHF World Junior Championship. "The guys at the evaluation camp like Seth Jones and [Ryan] Hartman, the [J.T.] Compher kid impressed me, [Ian] McCoshen was very, very good," he said. "I'm going to try to keep an open mind and see … I'm sure they'll make some nice plays out there that are going to create some attention." And as much fun as the players will have Saturday in Buffalo, the coaches are just as excited to be in town. McClanahan and Housley were drafted by the Buffalo Sabres and made their NHL debuts with the organization. Both played under legendary coach Scotty Bowman, who will drop the first puck Saturday. "It's probably been 30 years since I've been here," McClanahan said. "I saw [Sabres coach and former teammate] Lindy Ruff last night. I haven't seen Lindy since I left Buffalo. I saw Scotty Bowman. It's been a lot of fun so far." Housley said, "I've got to really thank the Sabres for hosting this event. They've done a terrific job. People don't see behind the scenes what's going on. They've opened their arms to USA Hockey. You can't appreciate enough what they're doing down in the locker rooms -- everything. It's been great for me to get back here. I think Buffalo is a great community. The fans are very loyal to their teams. It was a great place for me to start."